Making the best land use decisions possible is of foremost concern to our organization. And, if there is one thread running through the community, it is our desire to protect the unique characteristics of our valley – its beauty, tranquility, healthy environment and sense of community. We all want to preserve and enhance agricultural endeavors which enrich our quality of life. The vision of a well planned future for the valley is sustained by the continuous protection of our many unique resources. Our members can rest assured that, with your help, WE Watch will continue to monitor new development plans, attend and speak at public meetings, work closely with other community groups, and watch for any land use changes to our valley. Note: We will notify you about the next Board of Supervisors hearing on cannabis regulation so you can e-mail Board members and/or attend the hearing. On Tuesday, Jan. 29 at the Board of Supervisors meeting, a standing room only crowd of residents, including vintners plus cannabis growers filled the Santa Barbara Board’s Hearing Room. Seventy people signed up to speak, including WE Watch. The hearing and board deliberations lasted about 4 hours.The results were encouraging. This process will take about 6 weeks to return to the Board and will involve Planning Commision review. *Parcel limitations (e.g. limits on size of grow). WE Watch supported all the above decisions. Our early December request to the Board for help may have encouraged \the 1/29 meeting. The WE Watch sponsored 1/17 Lecture on Cannabis Regulation by County staff provided more than 200 Valley and other County residents with needed information. Last week WE Watch sponsored the first ever countywide,face-to face meeting of representatives from regions experiencing cannabis problems (Carpinteria Valley, Cebada and Tepusquet Canyons, Cuyama Valley + SYV’s Santa Rosa Rd, 154 & Edison, + other Valley neighborhoods where applications have been filed – Fredensborg Canyon &Armour Ranch & Kentucky Rd). Attendees reached consensus on several recommendations, which were included in each region’s presentation to the Board. 2. Planning Commission – Hoop Structure Ordinance. The Planning Commission met the next day (1/30) and voted to make recommendations to the Board of Supervisors about the Hoop Structure Ordinance.The first deliberations were in May.WE Watch, Buellton and Santa Rosa Road residents began speaking at Commission meetings in early summer. *Riparian setbacks to be 50 feet from bank and/or riparian habitat. On May 31st Russell Chamberlin invited us out to the family ranch to learn firsthand what carbon farming is all about. I have to say that there was not a lot to see, probably because the scarce rainfall this year has not allowed the composting to truly take effect. It was a perfect morning, sunny but not yet hot. We assembled in a field adjacent to USCB’s test plots. WE Watch members were joined by a throng of other interested folks, including followers of Gerri French, a nutritionist and teacher through SBCC Continuing Education, and members of the Community Environmental Council in SB, one of the sponsors and promoters of this effort. Russell spoke about some of the components of his carbon farming plan, supported by a grant from the State of California Healthy Soils Initiative. Two elements that are most important are rotating the cattle so they only eat about a third of the grass and trample down the rest, creating a nice mulch. The other is spreading ¼ inch compost over the grass in a onetime application that will last 30 or so years. Combined, these two procedures enhance the quality of the soil and its water and carbon retaining ability. Sigrid Wright, the Executive Director of the Community Environmental Council (CEC) and Allegra Roth, Food and Climate Control Associate for the CEC, also spoke to us about their ambitious plans to extend this carbon farming protocol to 15% of the suitable grassland in our County or 42,000 acres. This would offset the carbon emissions from the county’s entire agricultural sector. The amount of carbon stored in the soil as a result would be like taking 11,350 cars off the road every year for two decades. Best of all, it will preserve our rangeland for future generations. In August 2004 the Board of Supervisors initiated a draft project description of the SYVCP update. On February 15, 2005 the Board of Supervisors substantially reduced the area covered by the plan. Early in 2005 Third District Supervisor, Brooks Firestone, appointed a new Valley Planning Advisory Committee (VPAC) to refine and offer alternatives to the previous work of the GPAC. Another series of public meetings was held. On September 26, 2006 the Board of Supervisors sent the SYVCP update out for an Environmental Impact Report (EIR). The Draft EIR was released for comment in July 2007. The Draft EIR was then revised in response to public comment. The SYVCP and EIR went on to the Planning Commission in May 2009. The Commission conducted five public hearings on the Plan before certifying the EIR and recommending adoption of a revised SYVCP to the Board of Supervisors on July 15, 2009. The SYVCP was then sent to the Board of Supervisors for consideration. The Board voted to approve the Plan on October 6, 2009. W.E. Watch has been very active in this lengthy process. Our members served as part of the Valley Blueprint, GPAC and VPAC committees presenting a perspective in keeping with our Mission Statement and Guiding Principles. (See About Us.) When the Draft EIR was released, W.E. Watch members reviewed and commented section by section on all the topics including the sufficiency of mitigation measures. Multiple WE Watch Board members were present at each of the Planning Commission hearings and presented both oral and written comments..
Fee-to-trust is a process established by the Federal government to allow recognized Indian tribes to increase the size of their reservations by removing land from the county and state and placing it within the trust (their reservation). This originated to allow Indians the means to survive economically. Any lands within the trust are exempt from state and local taxes and regulations including zoning. Such transfers affect the local community in many ways. First and foremost, once land is in the “trust” the local community has lost its ability to influence its use. Local zoning, ordinances, and regulations no longer apply. For example, land previously zoned for agriculture might be used for high density housing with no input from the community. This is possible because the ”trust” is no longer part of the county. It becomes part of the reservation which is considered a sovereign nation. In our case, it is as though a separate country exists within our valley. Once land is placed within the “trust” no property taxes or state taxes apply. This is a potentially substantial revenue loss for the county. Loss of community control and reduction of the county’s tax base are the reasons WE Watch believes any fee to trust transfer application demands very careful, thorough review, with community input, before action as appropriate is taken. 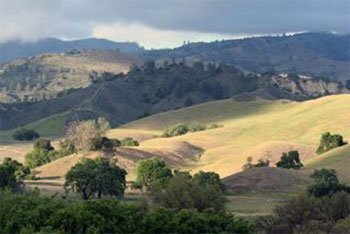 In 2010 the Santa Ynez Band of Chumash Indians purchased 1400 acres, known as Camp 4, from the estate of the late Fess Parker. Not contiguous to the Chumash reservation, this land is located at the northeast corner of 154/246. An application was made to the Bureau of Indian Affairs in the Department of the Interior to annex Camp 4 to the reservation through fee to trust. Such a transfer would increase the size of the reservation ten-fold. This application was appealed by several individuals and organizations in the Valley. In 2016 and again in 2017, Congressman LaMalfa, who lives 500 miles away from the Santa Ynez Valley, introduced legislation to insure the annexation of these lands to the Chumash. The current bill, AB 1491, although approved by the House, is still pending Senate approval. Believing that this was a decision that should be made at the local, not the national, level, WE Watch joined a consortium of Valley organizations (the SYV Coalition) opposed to the federal legislation, and supported our Third District Supervisor in one-on-one negotiations with the Tribal leadership through an Ad Hoc Committee of the Board of Supervisors. Knowing that the Chumash Tribe wanted to develop Camp 4 for tribal housing and a tribal community center, WE Watch believed that this might be done within the parameters of the General Plan. In September 2017, a tentative agreement (MOU) was announced between the County Ad Hoc Committee and the Tribe. Hearings were held in October, and on October 31, the Board of Supervisors approved the MOU, agreed to drop its lawsuit, and to support AB 1491 so long as it included details of the agreement. The Board of WE Watch was divided because, on the one hand, we had always opposed the annexation of Camp 4 through fee-to-trust, but, on the other, we wanted to develop a more trusting relationship with the Tribe, that we believed needed this housing for tribal members and we thought was committed to good environmental stewardship. As a result, although we testified at the hearing, WE Watch neither supported or opposed the County Memorandum of Understanding. The SYV Airport Authority was created in 1993 and is responsible for managing the airport. As required, a Land Use Plan was prepared and accepted by the Board of Supervisors in January 2002. Subsequently, the SYV Airport Authority submitted an application for expansion of the airport. After numerous amendments, an Initial Study was released in May 2007, stating that only a Mitigated Negative Declaration would be required rather than an Environmental Impact Report (EIR). Concerned about the possible effects of an airport expansion, a diverse coalition of community groups, including W.E. Watch, began meeting in 2006. This group submitted comments on the Initial Study in June and August 2007 and stated that an EIR should be required. Ultimately, the coalition hired a graphic artist and an attorney to press the claim that an EIR was required due to visual impacts alone in addition to other concerns. The SYV Airport Authority has withdrawn the previously submitted expansion application and has stated that another will be submitted. Update: The Sphere of Influence was voted down on February 26, 2018 by the Solvang City Council, voting 5-0 to abandon the study. Mayor Jim Richardson said the public response had changed his mind on the issue. One of the public speakers at two meetings was Penny Knowles, speaking on behalf of WE Watch, making the point that increased population in Solvang with attendant traffic problems, etc. affects not only Solvang, but the entire valley as well. Some Solvang residents have formed a group called Save Our Solvang opposing Solvang City Council’s move towards annexing 15 parcels of land, a “Sphere of Influence” increase of almost 30% (450 acres). WE Watch agrees with this group and feels that this unnecessary growth would be to the detriment of Solvang’s small town character and the largely rural nature of the entire valley, major reasons we have chosen to live here and specifically in Solvang. We were surprised to learn that ordinary Solvang residents would have no vote about the soon to be made public Sphere of Influence Study, adoption of the Sphere of Influence, or eventual annexation and development of these lands. The only voters would be Solvang City Council (5 residents), LAFCo (Local Agency Formation Commission) with Mayor Richardson serving on LAFCo as well as City Council, and potentially the landowners involved. Petitions opposing the annexation have been circulated throughout the valley and so far have collected 685 signatures.